Urban fear is imbued with rational and irrational dimensions, some interlinked with, others independent from, urban life or the discourses of fear analysed in the previous chapter. 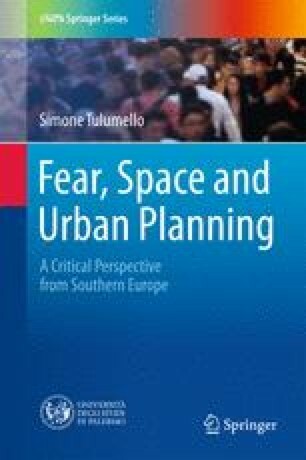 This chapter, acknowledging that fear is not a simple ‘effect’ of specific ‘causes’, deepens the understanding of fear: it looks at the way fear is generated at the intersection of urban space and otherness, to build a theoretical framework supported by the work done by David Sibley on the geographies of exclusion and Iris Marion Young on the politics of difference. Diversity in urban (and especially public) space is debated, exploring encounters within contemporary, multicultural cities, with the aim of unpacking the role of feelings in the creation of relations between identity and otherness. Then, the chapter debates that the way the creation of such relations is necessary for the self-representation of societies and how the politics of exclusion are embedded in the construction of dichotomies such as ‘we’ versus ‘the others’ and the misrepresentation of (minority) groups. In conclusion, the chapter links such themes with urban studies and policy: it critiques Jane Jacobs’ theories on urbanism and exemplifies the processes of stigmatisation/removal through the case of ‘nomad camps’ in Italy. Iacona, R. (2009). Caccia agli zingari. Documentary movie, screened 22 February on Rai3. www.rai.tv/dl/RaiTV/programmi/media/ContentItem-4a7c8533-7b4a-43c1-882e-b430d6cabfe1.html. Accessed 1 June 2016. IREF (Istituto di Ricerche Educative e Formative) (2010). Rom, Sinti, Caminanti e comunità locali. Studio sulle popolazioni Rom, Sinte e Camminanti presenti nelle Regioni Convergenza. www.retepariopportunita.it/Rete_Pari_Opportunita/UserFiles/programmazione_2007_2013/Elaborato%20di%20sintesi%20ricerca%20Iref%20su%20Rom%20CIG%200382566771.%20doc.pdf. Accessed 1 June 2016. Mora, M. (2008). La Camorra lidera la persecución gitana. El País, May 18. http://elpais.com/diario/2008/05/18/internacional/1211061601_850215.html. Accessed 1 June 2016. Mora, M. (2009). Condenada a ser condenada. El País, February 1. http://elpais.com/diario/2009/02/01/domingo/1233463953_850215.html. Accessed 1 June 2016. Pew Research Center (2014). A fragile rebound for EU image on eve of European parliament elections. www.pewglobal.org/files/2014/05/2014-05-12_Pew-Global-Attitudes-European-Union.pdf. Accessed 1 June 2016. Strati, F. (2011). Italy. Promoting social inclusion of Roma. A study of national policies. www.cestim.it/argomenti/03rom-sinti/11_07_it_strati_promoting_the_social_inclusion_of_roma.pdf. Accessed 1 June 2016.